No rests for the weary! Brett and Andrea’s Jewish wedding was certainly a highlight last weekend, but the rush back across the alley to be back for Sunday morning’s event was well worth the drive! Delia called me just a few weeks ago. Her “real” wedding was planned for March 7th, this coming Sunday, but her in-laws, Mitch’s parents would be unable to make the trip to New York for the wedding ceremony. As the daughter in law, it was very important for her to celebrate this moment with Mitch’s parents, and to give them the opportunity to celebrate this simcha with their friends as well. Delia, the brilliant, compassionate woman that she is had a stellar idea! She called me to ask if I as their Cantor and wedding officiant would simulate in its entirety, a Jewish wedding ceremony complete with all the bells and whistles, without having to “make it legal”, which of course, was just fine with me! So, last Sunday, on a magnificently sunny but cool winter morning in Highland Beach, FL, I performed a beautiful Jewish wedding ceremony for Delia, Mitch, his parents. and 30 of their closest friends. I was incredibly impressed with the way the Holiday Inn, Highland Beach set up the ceremony location, right on the water, on the patio, off the dining room. What really touched me, was that now, Delia’s parents were not present, so Mitch’s Dad walked Delia down the aisle, as Mitch’s mom walked her son. They chose four close friends to hold my self-made chuppah poles, and because of the time of day – bright and early on Sunday morning – we used an alternative “fruit of the vine” – oranges. Well, kind of like a vine, I guess – but far more palatable, at that time of day! I didn’t have much time to get to know Delia and Mitch, but something happens when I stand with a bride and groom at one of the most intimate moments of their lives. The feelings transcend the experience and as Delia and Mitch emotionally shared their vows repeating after me, I felt like I had known them forever. It was a beautiful moment, incredibly real, and equally as moving as I’m sure their wedding ceremony will be this coming weekend. I’m so happy I was there for them, and Mitch’s parents called me immediately the day following the wedding to thank me beyond words. It is families like this that make my job as a Cantor and wedding officiant so joyous and happy, and I am so honored to have had the privilege of beginning Mitch and Delia’s weeklong Jewish wedding celebration! Best of luck to you both, and enjoy the wedding! It’s been a busy year. Incredibly busy. And, fortunately for me, almost every weekend during the year has been booked, sometimes with one, but often with even two or three events in one weekend. There hasn’t been much room for anything spontaneous (let alone blog writing), but, last Saturday was just – different. It was a day that for whatever reason remained open in my calendar. A Saturday? Not a single event, from morning to night. Sure, I had something on Sunday, but I kept wondering to myself, for months why that particular Saturday was just sitting there…alone and empty. But now I know, it was meant to be that way. As a side note – it struck me that amid some of the worst winter weather we had been having, as I was driving across Alligator Alley, I was amazed at what a beautiful day it was, cool, crisp, and incredibly sunny. I was certain there was something divine going on here, but just not quite sure what. Sure enough, I arrived at the resort, found the coordinator, checked in, made sure everything was in order, and before I knew it – it was time for the Ketubah signing. I met both Brett and Andrea just before, and they were one of the cutest, sweetest Interfaith couples I had ever met. Their friends in the bridal party were so excited that I was there, and so grateful that I had arrived, and I just knew that I was right where I was supposed to be. The setting for their Jewish Interfaith wedding was amazing, the weather was perfect, and the family was ecstatic. And there I stood, waiting for Brett and Andrea to arrive at the chuppah, and took a moment and looked up at the sky, and offered a special moment of thanks, for leaving this day open, for leading me here, and for being able to make a very special couple’s Jewish Interfaith wedding dream come true. We don’t always know why things happen, and we don’t always know what is in store, but I learn more and more, that every day, we are exactly where we are meant to be. I’m so grateful that I had the opportunity to marry Brett and Andrea, for meeting their parents, who were also so grateful for the Jewish Interfaith wedding ceremony and for the way things worked out, and for the new friends I have made as a result of it all. I’m so grateful to G-d, for allowing me to be right where He wanted me to be. People always ask me.. “What is the most unique Interfaith wedding ceremony you have ever performed?” I’m assuming they want to know about exotic locations I’ve been to, but unique weddings mean something very different to me. This month, I added a new type of unique – a Jewish Hindu wedding ceremony which turned out to be magnificent! When I think about my most unique Interfaith weddings, I immediately think about the unique relationships I have formed, not only with my couples, but with their friends and family as well, because to ME – that is what makes MY weddings most unique! For instance, when I’m asked that question, I am always taken back to Dan and Rita’s in Mexico, Felix & Evelina’s in Aruba, Jenni and Mike’s in Fort Lauderdale (diverted from Mexico compliments of Swine Flu), and now, Cheryl and Prav. Unique to me, are Interfaith couples and family who are now as close to me as my own family, and whose experiences made a lasting impression on me – for years to come. And now, I can add Cheryl and Prav to that list. From the moment I spoke to Cheryl, we were in love! She and Prav live in Raleigh, NC, but her mom lives in Boca Raton and so we made plans to meet on her next trip to South Florida. Cheryl, Prav, her mom Joselyn, and Step-Dad Ted all met at Cheesecake Factory for dinner, and had the best time. It was important to Cheryl that I knew her and Prav – I mean – really knew her, and Cheryl LOVES to share, so getting to know them as individuals and as an Interfaith couple was very easy. Cheryl and Prav have hearts the size of Manhattan. They would do anything, give anything, be anything, to and for anyone they loved, because that is just who they are. And boy oh boy – do they love each other. Yeah, I know – every couple on their wedding day really loves each other, but seriously, this Interfaith couple is different. The love they share for one another brings each of them to tears – at least 3 times a day. I seriously think Prav prays three times a day, and each time, his #1 prayer is one of gratitude for Cheryl – and vice versa. I’ve never seen a couple so incredibly grateful for each other, and that’s part of what make Cheryl and Prav so unique. So, on December 21, at Coconut Cove in Islamorada, Florida with the most beautiful ocean behind me, and the most beautiful couple in front of me, I joined Cheryl and Prav in marriage, in a night I will likely never forget. The venue, I just have to say, was one of the best places I have ever performed an Interfaith wedding ceremony at. First and foremost, it is a beautiful piece of real estate, but Paul and Magda run the operation, and they run it like it was their own wedding. The food is amazing, but it was also the layout I loved most. Guests could dance, but the dining area was separated from the dance floor, so we could enjoy each other’s company, if we chose not to dance. And the fact that it was a private location – without 10 other weddings going on at the same time made it feel so personal, and warm, that it was incredibly enjoyable! BUT – the most amazing part? 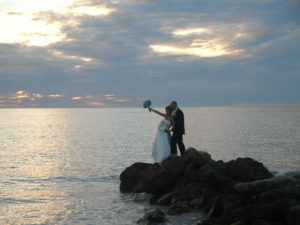 How about taking your first dance on the packed-sand beach, with fireworks being set off behind you? Priceless, incredibly priceless. The most priceless part, overall, however, is my Cheryl and Prav. I love how they love each other. They inspire me. They encourage me. They have become incredibly meaningful in my life, and I can’t imagine life without them. Now, that’s unique. Love you, Cheryl & Prav! 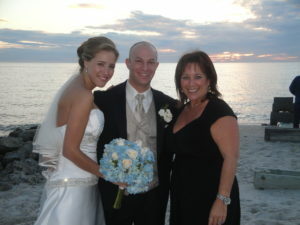 When you are looking for a celebrant for your Florida wedding, Destination wedding, Bar Mitzvah or Bat Mitzvah, Baby Naming and more…Cantor Ballard is the perfect answer. Her rich, warm voice, infectious smile, and passionate personality will make all the difference in making your ceremony one to remember. Thank you for visiting my website, and now that you have, let me tell you about who I am, and what I do. I am an Independent Lifecycle Officiant. Together with my clients, I work closely with you to create the perfect ceremony. From Weddings, to Bar Mitzvah/Bat Mitzvah, Baby Namings, Shiva services, and other milestone events, we will co-create a celebration that you will remember your entire life. I am located in South Florida, but am available to travel locally, nationally, and internationally. In an effort to bring meaningful Jewish traditions to your wedding or other lifecycle event, I would love to help you incorporate just the right traditions to make your ceremony not only a memorable experience, but one that honors your faith and heritage in just the right way. This means focusing on creativity, and making your event the most meaningful possible – just for you. My love for Jewish song and liturgy, combined with my personal warmth and spirituality is evident in the transformational ceremonies I officiate. 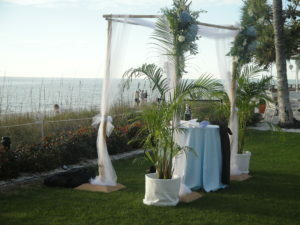 I look forward to creating a meaningful, uplifting ceremony that you are sure to love! I will also be updating my BLOG regularly, so please check back often, and as always, feel free to contact me any time with your thoughts or questions. Read my Wedding Wire reviews! Up until now, you might have known me as Cantor Debbi Ballard, or Debbi, or even Cantor Debbi. Well, I have an alter ego you may not know, and might not have even guessed existed. Lots of people read my Facebook page, and see all the great things I am constantly doing, and they would be surprised to know that I am officially – the world’s WORST procrasinator! Well, maybe I’m being a bit harsh on myself, but really – this procrastination thing tends to bury a little seed, and if you let it take root for just a split second, it begins to pervade your life in the worst kind of way. I knew May was going to be a ridiculously stressful, however highly rewarding month. For the most part, May turned out exactly as I thought it would – a whirlwind month, with so many incredible experiences. Toss in a few things I just didn’t expect, with a couple of personal setbacks I didn’t see coming, and BOOM – the seed was planted, and took root, instantly. What began as “I’m tired, burned out, and just don’t have the creative energy to write” turned into a self recriminating mantra that kept telling me that I wasn’t half the person I professed to be, if I couldn’t write just one blog entry this month! Well – the self recriminating voice is gone. We all have bumps in the road, don’t we? Where would we be without setbacks that make us see just how strong we are? Where would we be without experiencing some of life’s failures – just so we can appreciate the little successes with fervor and exuberant joy? Once again, Danny Maseng’s Return Again, or even stronger – Joel Osteen’s Begin Again series, giving me the permission to allow myself life’s little failures of time and followthrough, with a free pass to get back on track. Begin again…isn’t every day a new beginning? It’s so difficult to navigate life and be everything to everyone who needs us to be one thing or another. Our clients, our family, our children, our community, our creditors, our friends, our less fortunate neighbors, the list is endless. I sometimes forget – or wonder if I ever knew – who do I serve first? What if I want to serve everyone, and the population’s desires of me are incongruent? I tend to slip out of life when that happens. I tend to forget that I must serve myself first. Rev. Ernest Chu, author of “Soul Currency”, today reminded me that those of us with such strong compulsions to give – often forget to serve ourselves first – or even at all. Well, it doesn’t take a rocket scientist to know that the vessel that continuously pours out, eventually runs out. Perhaps, the month of May was continuous pouring. I really forgot to take care of me, and I so appreciate the messages of today, telling me I am still an amazing woman, worthy of self forgiveness, compassion, and lots of tender love and care. Today was mine, and I can feel the blood really beginning to flow. I’m excited again to write about May. The wedding of Dan & BethAnne in Gainesville, with my all time favorite Catholic Priest – Father Tim. He is quite possibly the coolest Catholic Priest I have ever met! The wonder-weekend of Nick & Remy’s wedding in the Bahamas, followed by Jenni (the love of my life) and Mike here in Fort Lauderdale, and then the whirlwind 2000 miles in 48 hour weekend of a Bar Mitzvah, 2 weddings, and a Bat Mitzvah. I knew I would need time to recover, and here I am, on June 27th, looking July squarely in the eyes, wondering where in the hell did time go? It doesn’t matter – because every moment that flew by is in the past. I can only think about the present, and here I am – writing again, beginning again, and so excited to share all the joy that my life has seen the last month. Stay tuned, the writer is back. The procrastinator has been siezed!